The BBC reported this week that homemade play dough can contain enough salt to poison children. It said no fatalities have been reported, but advised that children should be watched carefully when playing with any play dough. It didn’t offer any alternative recipes that contain little or no salt, and it didn’t say that play dough is an amazing sensory material that offers so much to children who have the opportunity to play with it. Homemade play dough, used with thought, care and imagination, is perhaps the best childhood material there is, in my opinion. So, rather than feel scared that it might harm our children, and stop using it, let’s look at how amazing it is, and try a salt free play dough recipe. >>> see my Super Sensory Invitations to Play here! My children have been enjoying playing with play dough for over ten years. It is one of their all-time favourite play materials and I can see how it has enabled them to explore so many skills. :: it’s an amazing sensory material. Children learn through their senses, and providing them with opportunities to see, touch and smell interesting things helps them understand the world around them. Making your own play dough allows you to customise your recipe to add in all sorts of different colours, flavours and textures. We have tried lemon, chocolate, strawberry jello, ice cream, lavender, herbs, spices, gingerbread … to name just a few. :: it’s a versatile education material. 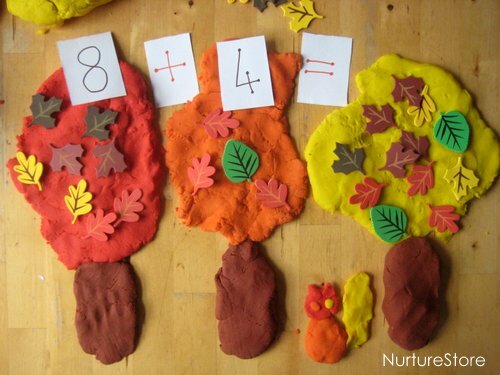 Because we learn through our senses, and because we learn better when we are having fun, and using different parts of our brain, adding a material like play dough into our learning activities helps our children. 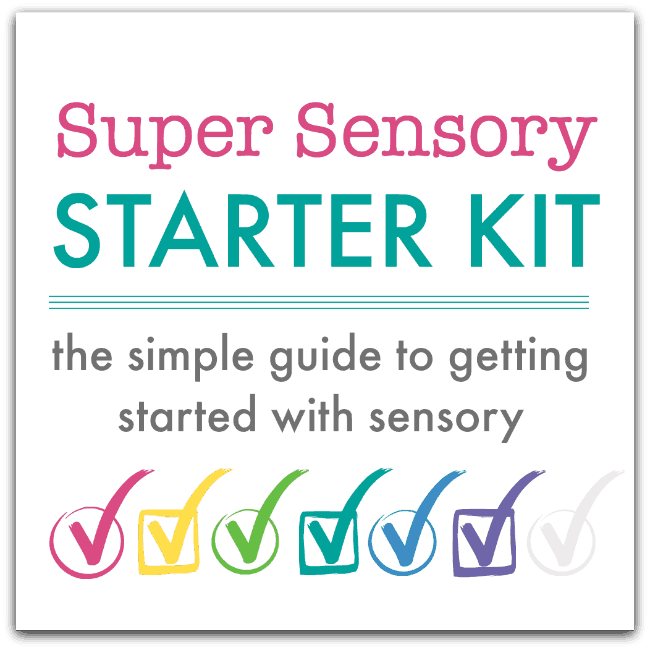 A multi-sensory approach to math and literacy appeals to all learning styles, and helps us to embed the new skills we are gaining. We like to use play dough for math games, to learn spellings and for creative storytelling. Play dough is also an excellent material to develop fine motor skills and wrist strength. :: it’s a suitable material for all ages, making it especially useful when you have a mixed-age group playing together. There’s no right or wrong way to play with play dough, so you can have toddlers, school children, and even grandparents, all joining in alongside each other, each using the play dough in a way that suits their age and stage. :: it’s pretty-much mess free. Compared to goop, paint, glue and even water, I find play dough the easiest material to tidy up. We take play dough with us when we go on holiday, camping and out to a restaurant, as it’s portable and quick to roll back up and pack away when we’ve finished playing. :: there’s no waste. I understand that some people have a policy to never use food in play, and I respect everyone’s choice for their own children. Below however, you’ll find my recipe for a play dough that you can bake and eat – which provides children will all the wonderful benefits of playing with a dough and makes you a meal when you’ve finished, so no waste at all. And a more traditional homemade play dough can be composted after several months of use, recycling the material rather than putting it in the bin. :: we don’t play with food. This recipe is one you can bake and eat, so think of it as making lunch, not wasting food. :: they are gluten-intolerant. 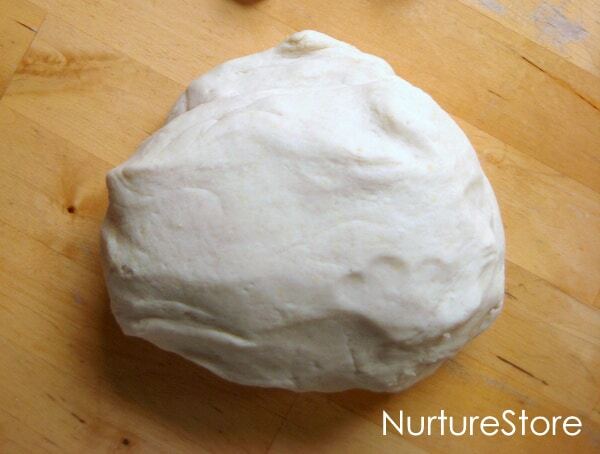 You can use a gluten-free flour in place of wheat flour in a traditional play dough recipe. You might need to adapt the recipe slightly, perhaps adding more oil. 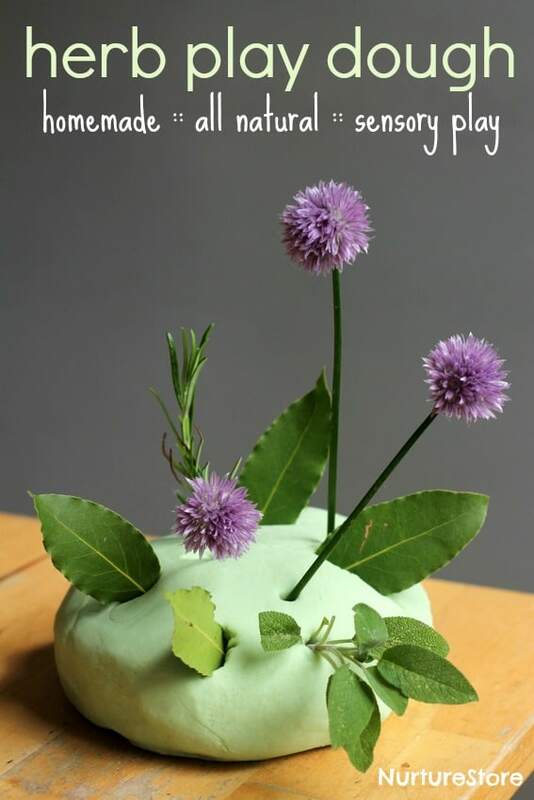 You can find a full gluten-free play dough recipe in my recipe ebook. And see below for a link to a gluten-free recipe for edible bread dough. :: it’s too messy. Really? If you play with it on the kitchen table, in a room where there’s no carpet, I think it’s really easy to clean up afterwards. :: I don’t know how to make it. You’ve come to the right place! Here’s a step by step tutorial on how to make play dough, and you can find many more recipes in my play dough recipe ebook. :: it’s boring. No way! There are endless ways to play with play dough. :: or using it with puppets? You can find a whole year’s worth of play dough based creative learning activities in The Homemade Play Dough Recipe Book. This recipe is all natural. It uses taste-safe ingredients. You can adapt it to make a gluten-free version. You can bake it and eat it, so there’s no waste at all. It’s bread! Old-school, easy-peasy, tastes delicious, bread. If you have a teaspoon of fast-action dried yeast you can add that. If you want to add some chopped herbs, go for it. Food colouring, spices, raisins, chopped dates, apricots or glace cherries, grated cheese….if you like. The flour, water and oil combination alone makes a good dough to play with and eat – my children had it for lunch yesterday! Place all the ingredients in a bowl and mix it up. When it comes together to form a dough, tip it out onto the table and have the children help you to knead. 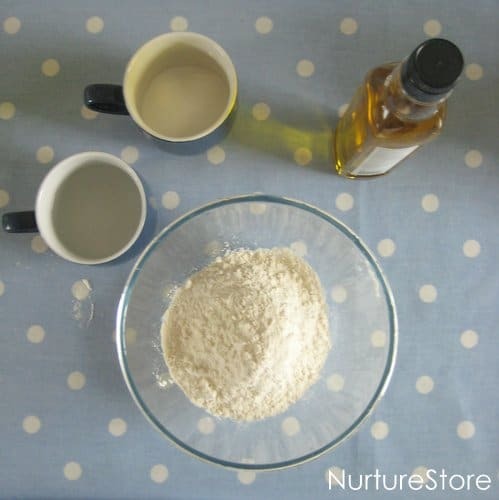 Add a little extra flour or water if needed – flour is a natural material, so it may require slightly less water or a bit more flour to get the right consistency. Each child can have a piece of dough. The measurements above are enough for 2 children to have a portion to work with, so adapt the recipe to suit however many children you have playing. You can shape the dough into circles, squares, funny faces, plaits, letters, numbers, whatever you like. 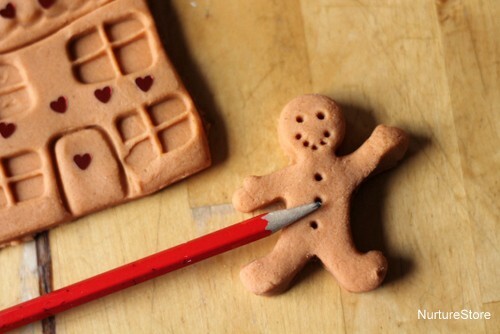 You can use your hands to model the dough, or use cookie cutters. When you are finished, place your dough on an oiled baking sheet and bake in the over at around Gas 7 / 220C / 425F. For how long depends on how big your bread shapes are – we usually bake for 10-15 minutes. When it’s done it should have risen and been a bit golden on top. Give your bread a tap on the underneath side using your knuckle. If it sounds hollow it should be ready, and if not, pop it back in the oven for a little bit longer. Allow the bread to cool before you eat it. We like ours with a little raspberry jam. Keep calm and play dough on! Child safety is paramount in all we do. Having said that, it’s our job as parents and teachers to know the children in our care and to make risk-assessed, sensible decisions about the activities we invite them to try. Sensory play activities should be supervised and we should always teach our children how to use any materials safely and responsibly, but we should also remember the huge benefits of exploring, creating, and playing. Don’t throw out the play dough because it seems scary – chose the right recipe for you, make a batch, and play with it together! would it be okay if I added food coloring to it just to make it more fun for my daycare kids? Hi Ashley. Yes, that should be fine. Have fun! This might sound really stupid, but if you just want playdough and not actual bread do you not bake it? I usually make my playdough on the stove, so it is heated up. Does this work without heating it? Hi Kathryn. 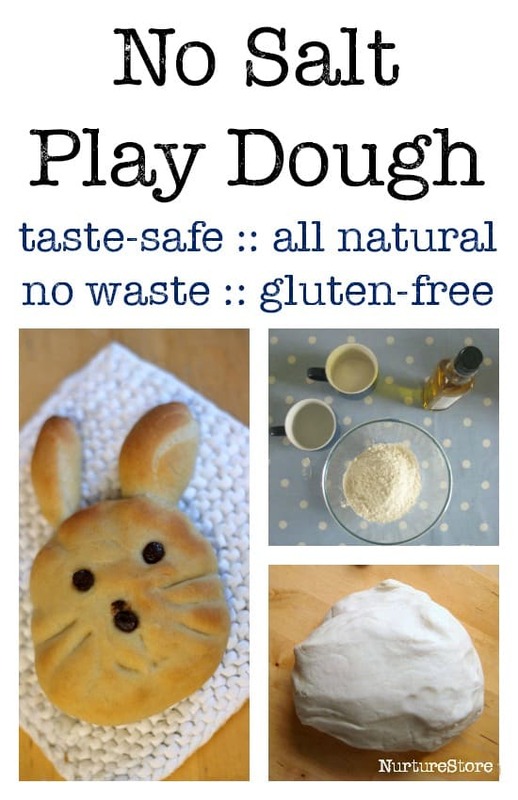 If you want to just enjoy it as a play dough (and not make the bread) then you don’t cook it – just combine the ingredients in a bowl and play! Like a no-cook playdough recipe. A ‘cooked’ play dough recipe contains a lot more water, unlike this combination which is mainly flour. So happy to have come across this recipe! Just made it for my girls and they’re loving it! Yay! Always happy to hear of children enjoying playdough! discovered this as we have run out of salt so was looking for an alternative. Was actually really impressed with how the baked product turned out and was lovely that we weren’t wasting ingredients. we added ginger to ours. 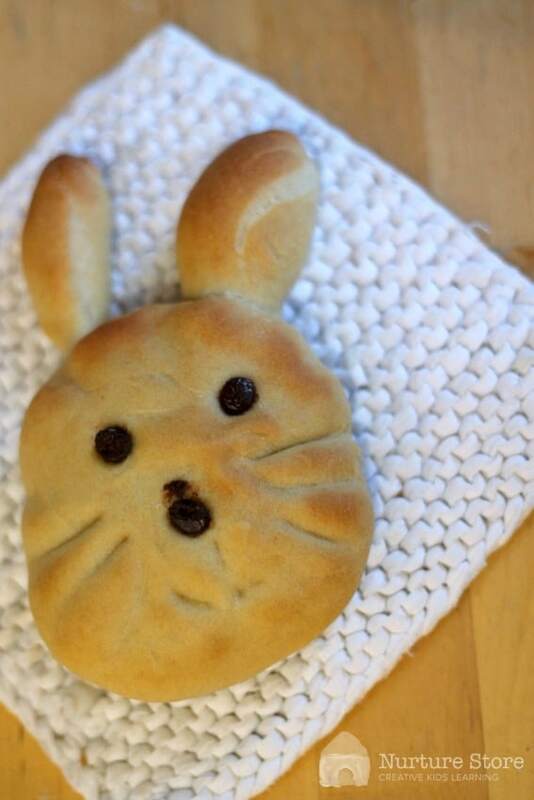 im looking forward to doing some with raisins and some with cheeses. Hi Rebecca. So glad you enjoyed this. It’s such a super, simple recipe. So if I dont cook it and just want to re use it. Will it last? Or will it mold? Crystal, this recipe won’t keep longer than a day or two. You’d need a recipe with salt in to act as a preservative if you want to be able to store it long term. You know, I make this bread all the time as a pan baked flat bread for myself, and never thought of using it as playdough. I made it with my kindergarten class as a “gingerbread” playdough to go with our literacy unit. They had so much fun! So glad they enjoyed it Katie! Hi this may sound daft I was looking for a salt dough recipe but have no salt came across this. Once it’s baked can I still paint it like I would salt dough? Hi Sam. Once it’s baked yes, in theory, you can paint it: you can use food colouring or paint, but it won’t last in the way salt dough does. So if you just wanted the experience / process art of painting it’d be OK, but it’s only bread so it’s not suitable for something you want to keep. Hi. I made it just now – a double batch for four children. It was a bit stuff for my 2 year olds and too stiff to go through play dough machine. Any suggestions please? Hi Hannah. I’d suggest a bit more oil, so it’s not too dry and has some flexibility. You might find it gets a better consistency as you play, as lots of kneading stretches the gluten in the flour – just like with bread dough. Can you use vegetable oil? Hi Kara, yes you can. Just wanted to say thanks so much for this recipe. I’ve heard so many stories about kids eating salt dough and becoming very poorly from it. We made a batch today and I split it and added food colouring to each section! It’s a big multicoloured mess now but we’ve added some chocolate chips and coconut to it and going to bake it in a minute! Great fun with my 22 month old! I’m so happy to hear you had fun with it Sian. Chocolate chips and coconut sounds yummy!